Guerlain Chicherit delights snowboarders as he nails the first-ever successful backflip in a 2013 MINI John Cooper Works on a ski jump in France. The new 2013 MINI John Cooper Works is able to do a lot of things well, but making a perfect backflip on a ski jump in Tignes, France isn’t one of the things listed in the new 2013 MINI sales brochure. But extreme sportsman, freestyle skier and rally driver Guerlain Chicherit showed snowboarders how to nail the perfect backflip in a 2013 MINI John Cooper Works in his native France. 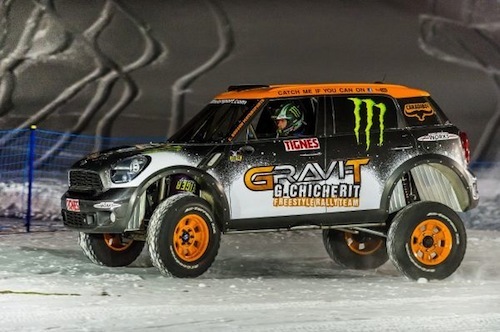 Chicherit took the MINI JCW to the winter sports resort of Tignes in France to prove it could be done. To the delight of the crowd, the MINI made the successful jump. Chicherit pulled off the first such maneuver ever performed in a car using a static ramp. The driver and the 2013 MINI JCW performed the near perfectly executed backflip and came back down to earth and landed on a fresh bed of powder unscathed. The specially prepared track was put together for Chicherit in a frigid snowscape in one of France’s best-known winter sports locations. Tignes provided the venue for the freestyle skiing competitions in the 1992 Winter Olympic Games. The 34-year-old Chicherit is no stranger to extreme snow sports. He is a four times freestyle skiing world champion and won the French rally championship twice. The Frenchman is also a veteran of the X-raid Team driving the MINI ALL4 Racing. The most recent MINI Backflip event in Tignes gave Chicherit the chance to bring together his motoring skills and his passion for extreme sports. This isn’t the first time someone has attempted to perform a back flip with a MINI, but up until now, it's always been unsuccessful. The new MINI can be outfitted to perform well in snowy environments like the Alps of France. The all-new 2013 MINI John Copper Works Countryman performance model is being offered for the first time with MINI ALL4 all-wheel-drive. MINI’s All4 All-wheel-drive is standard on the 2013 JCW Countryman and improves performance in wet or dry conditions and also helps negate torque steer. The MINI All4 uses an electromagnetic center differential to route power to the front wheels under nominal conditions and up to 50 percent of torque to the rear axle when additional grip is needed. The sport suspension on the Countryman has been tweaked and gets stiffer springs and dampers, and thicker anti-roll bars. The ride height has been lowered for additional performance handling, comes standard with 18-inch wheels and can be ordered with an aerodynamic kit. The 2013 MINI John Cooper Works was the perfect vehicle to pull off the first-ever backflip on a ski jump in Tignes, France. While owners will never take their MINI out to the ski slopes for extreme sports, with MINI ALL4 all-wheel-drive, it’s a good vehicle to tame the snowiest roads on the planet.